As part of a major season of programmes on the BBC, which will also include rare footage of Margot Fonteyn in Sleeping Beauty from the 1950s, ex-Prima ballerina Darcey Bussell will reveal the ballerinas who have inspired her throughout her career and out the other side. BBC2 will present Darcey’s Ballerina Heroines, on 1 March in which she will discuss the dancers who were pivotal in her training and career. The programme will also explore the “history of the ballerina through the female ballet stars who came before her”. The ballet season will be shown across BBC2 and BBC4 and will feature Fonteyn ’59 – Sleeping Beauty, an edited hour of highlights from Fonteyn’s appearance in Sleeping Beauty in 1959 which has rarely been seen since being filmed. It will be the first time viewers have seen extracts of the version of the ballet since its original screening, and will be broadcast on BBC4 on 7 March. Meanwhile, Dancing in the Blitz – How WW2 Made British Ballet will be shown on BBC4 on 5 March and will see Birmingham Royal Ballet director David Bintley explore how the Second World War “was the making of British ballet”. It shows how the Sadler’s Wells Ballet, later the Royal Ballet, was formed during the war. The season will conclude on 9 March with BBC4’s Good Swan, Bad Swan – Dancing Swan Lake, in which English National Ballet artistic director Tamara Rojo will take viewers behind the scenes as she prepares to perform one of the most challenging roles in classical ballet within Swan Lake. Rojo will reveal her insights on the role’s physical and psychological challenges while the season as a whole will give viewers a real glimpse behind the scenes of the ballet world. English National Ballet’s Artistic Director Tamara Rojo has announced the company’s 2014 season, which is set to include performances at the Barbican, which is new territory for the company. Previously solely classical, the company under Rojo’s instruction has begun to embrace more new works and modernised thinking in terms of opening ballet up to wider audiences. The Barbican will also fit with the company’s intrinsic tradition of touring and presenting ballet to new and existing audiences too. This change in tact from the young Director is the force behind her first new commissions for the company, working with award winning British choreographers Akram Khan, Russell Maliphant and Liam Scarlett in order to create new works for ENB as part of a programme of dance inspired by the centenary of WWI. This programme will be performed at the Barbican alongside a reworking of Associate Artist George Williamson’s Firebird. Exciting news for ballet fans also came in the form of the announcement that Rojo will be performing alongside ballet legend Carlos Acosta in Romeo and Juliet. This will reunite the iconic stars in the classic romantic production that was created for Rojo earlier in her career by choreographer Derek Deane when she first danced with ENB in 1997. 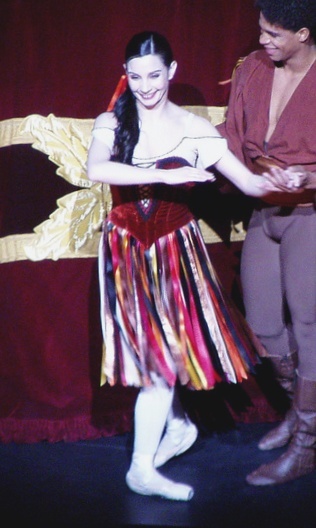 Rojo went on to dance the role of Juliet with Scottish Ballet, and last danced Juliet opposite Acosta’s Romeo in 2011 with The Royal Ballet, which included the choreography of the late Sir Kenneth MacMillan. ENB’s Romeo and Juliet will be performed by a company of 120 dancers and actors at the Royal Albert Hall in June 2014, so it is certain that the upcoming season looks sure to both delight audiences with older works, in particular this epic staging of the classic work by Shakespeare, and sparkle with new commissions. Following the appointment of The Royal Ballet Principal Tamara Rojo as Artistic Director of English National Ballet, the company has been a world of change, from the management to the pointe shoe clad dancers themselves. As part of her new position, Rojo set both the tutu twirling dancers and those behind-the-scenes a very simple and inspiring vision. Announced during the company’s first press call with Rojo at the helm, the message was clear: she aimed for English National Ballet to be the most creative and most loved company in the UK through what was produced for stage in cherishing ballet traditions, and also aspiring to the new. January has seen English National Ballet rebrand, discarding their black and white logo for one which is a pink and red quotation mark/pointe shoes, a gentle reminder that everyone has something to say. In addition to a fresh logo, an important part of their new identity is the focus on collaborating with creative artists outside of the ballet world, such as with fashion designer Vivienne Westwood. This iconic British fashion house has worked closely with the company to eclectically style the dancers, with the images to be used across advertising and marketing material for 2013. Achieving this new vision will also be fulfilled through collaborations with choreographers, designers, artists, and partner organisations. By presenting the company in a very different light to the world, Rojo aims to bring the artistry of ballet to as many people as possible, and transform the company along its journey. Whilst some may argue that the rebrand will diminish any form of the company’s previous prestige and influence, Rojo’s bold determination and confident creative leadership cannot be faulted. Her aspirations to ensure the company’s artists continue to excite, innovate and challenge mean that the company will be dancing to conjure wonderful, beautiful visions individually. On 24 September, English National Ballet held its first press conference set in the ballroom of the Corinthia Hotel in the heart of London. 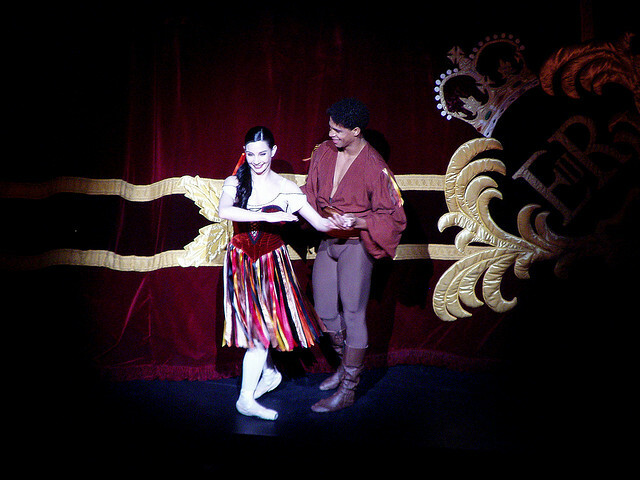 It highlighted new Artistic Director Tamara Rojo’s next steps, alongside a Bluebird pas de deux from The Sleeping Beauty performed by Shiori Kase and Yonah Acosta. ENB are on the brink of their 2012/13 season, and it is Rojo’s first in the role, laying down her pointe shoes momentarily before she joins the cast later in the season. Rojo coincidently danced with ENB fifteen years ago as a young, aspiring ballerina, eventually making her way to The Royal Ballet and continuing her journey adorned with tights, tutus and tiaras. Rojo spoke of her time with ENB, helping her to create her dance values through its ethos “to bring ballet to the widest possible audience”. It had a lasting influence on Rojo’s own views of the responsibility and impact of art toward society. Consequently throughout the press conference, Rojo not only presented the seasonal preview of ENB but also her own vision and aspirations for the next few years of the company. Rojo outlined her ambition to transform ENB into the most creative and loved ballet company, embracing and commissioning new work whilst keeping the classics relevant in a balance to move forward artistically whilst paying homage to the past simultaneously. Rojo also aims to build on the company’s tradition of being an institution which nourishes artists and collaborates with others working artistically to maintain excellence, creation and imagination. The repertoire to be covered by ENB in the upcoming season includes The Nutcracker at Christmas, the Albert Hall Swan Lake and The Sleeping Beauty. This is alongside some London based mixed bills presenting repertoire such as Jiří Kylián’s Petite Mort and My First Cinderella, to be choreographed by George Williamson (choreographed Firebird for ENB earlier in 2012) which follows on from and My First Sleeping Beauty earlier in the year. Williamson will also be responsible for the Emerging Dancer Award and will develop collaborations with other organisations. Image courtesy of Scillystuff at Flickr. Whilst the legendary classical ballet creation The Nutcracker is usually in abundance during the holiday season all over the world, it seems there may be another contender for 2012 in the form of The Sleeping Beauty. English National Ballet has just publicised its casting for the 2012 production. Newly appointed Artistic Director Tamara Rojo has not laid her pointe shoes and tutu aside just yet, as she will be filling the shoes of Princess Aurora on selected dates, partnered by the young, talented Principal Vadim Muntagirov. As one of the world’s favourite fairytales, the ENB version of the plot sees the enchanting magic of castles and curses, with fairy interludes. Accompanying this well-loved tale, Tchaikovsky’s score is featured heavily amongst Kenneth MacMillan’s unmistakeable choreography, as well as including the score of Once Upon a Dream as used in the trademark Sleeping Beauty version by Walt Disney. On the alternative side of the coin, Matthew Bourne will be re-imagining the classic story with the world premiere of his own version of Sleeping Beauty, in the culmination of New Adventures’ 25th birthday. This particular production of Bourne’s will complete his tiara trio of ballet masterworks that began with Nutcracker! and progressed to the international smash hit Swan Lake. As with all Bourne’s works, the timeless fairytale from 1890 is turned on its gothic head and jumps forwards a century to the present day. The now supernatural love story pushes beyond the constraints of time in true Bourne style. Spreading the influence of The Sleeping Beauty this year includes a host of Sleeping Beauty events from ENB, enabling ballet fans to experience the world of ballet through talks, masterclasses and dance workshops in theatres on tour and in London, allowing even the smallest Lilac Fairies to don their tights and satin shoes. For Bourne’s production, to celebrate the company’s 25th anniversary, Sadler’s Wells has hosted talks throughout the year focusing on aspects of Bourne’s work and his long association with the theatre, with Sleeping Beauty being the final instalment. In this particular talk, Sadler’s Wells Artistic Director Alistair Spalding will talk to Bourne about the premiere, as well as his plans and hopes for the next 25 years of New Adventures. Whichever version you choose, The Sleeping Beauty is not to be missed!